When someone falls on tough financial times, more often than not, his self-respect takes a hard hit. If it gets to the point when he’s not sure where his next meal is coming from – along with the desperately needed handout, he also has to swallow his pride. 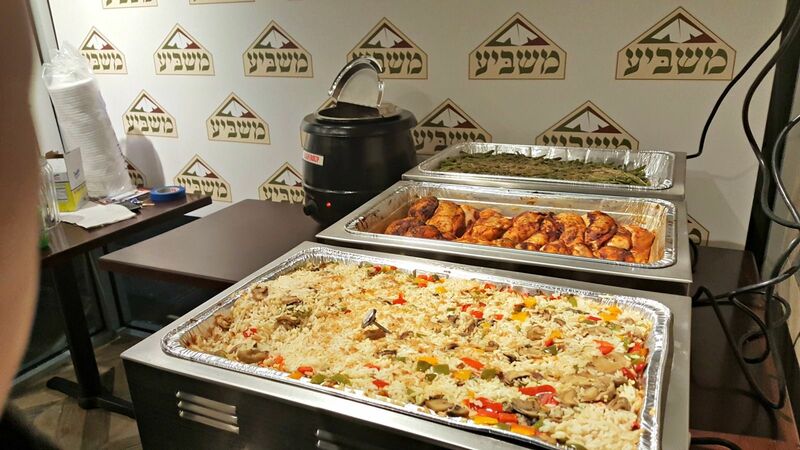 Not at Masbia – a kosher soup kitchen designed to nourish the body and spirit. In response to an increasing need for food assistance in Brooklyn, New York’s communities, Alexander Rapaport, executive director, and his friend Mordechai Mandelbaum, both Brooklyn residents, decided they could no longer live with the knowledge that there were people in their midst who went to sleep hungry every night. They had to do something about it. Together they launched the Masbia soup kitchen. In April of 2005, Masbia, which means “satiated” in Hebrew, opened its doors to anyone in need of a hot nutritious meal in a dignified atmosphere. From the outset, they made sure the décor would create the feel of a high-end restaurant, complete with polished wood floors, cloth-covered tables, and colorful wall paintings. A maître d’ welcomes each guest and formerly-dressed waiters graciously serve the food on trays. On its first night, Masbia served five diners. A few days later, seven guests arrived. The following Monday the number had grown to 40, and continues to grow. From 2009 to 2010, the operation expanded to two more locations; one more in Brooklyn, and another in Queens. Masbia currently serves an average of 2,000 hot dinners each week. Ficus trees and elegant curtains surround each table, protecting each customer’s anonymity while they enjoy a nutritious salad, beverage, soup, chicken or fish, two side dishes and dessert. The menu is largely dependent on the produce and foodstuffs donated each day. In order to generate fresh and local produce donations, Masbia actively networks with local farmers and CSA programs. Each site has an OU Kosher RFR supervising all the food products that come in. At the Brooklyn site where all the meals are cooked, packed and delivered to the other Masbia locations, an RFR oversees the entire process. Masbia also offers emergency food packages that contain enough food products (all OU Kosher) to feed every family member three solid meals for three days. They distribute close to 50,000 pounds of food each week. Each day, hundreds of dedicated volunteers continue to help peel potatoes, chop vegetables, assist in serving dinner, and perform inventory for the food pantry. What started as a vision shared by two friends has become a nourishing and comforting reality for thousands of grateful men, women and families. Masbia’s masterminds call it “a restaurant without a cash register.” Evidently, it runs on the power of the heart.